Thanks to a resourceful aunt (amended!) for locating it, you can click right here for more information on Al Atkey, son of Alfred Atkey, who I met along the Alaska Highway. If you scroll down and read the second Web Reference from the Anchorage Daily News there is an article about him. The original link to the Anchorage Daily News article is unfortunately broken but the text is preserved by zoominfo at present. My original post is here. Q. What is your destination? A. The smart answer would be there is no specific destination unless you count my starting point, namely Denver! I will likely leave the Land Cruiser at various points along the way and return home to catch up with admin (as with next week) or just to take a break once in a while! To answer the question in terms of Alaska, Prudhoe Bay, north of the arctic circle, is the northern most point that I intend to visit via the Dalton Highway. My aim is to be at the Arctic Ocean for midsummers day. Of course, that is also one of the start/end points for the unofficial Pan-American Highway. 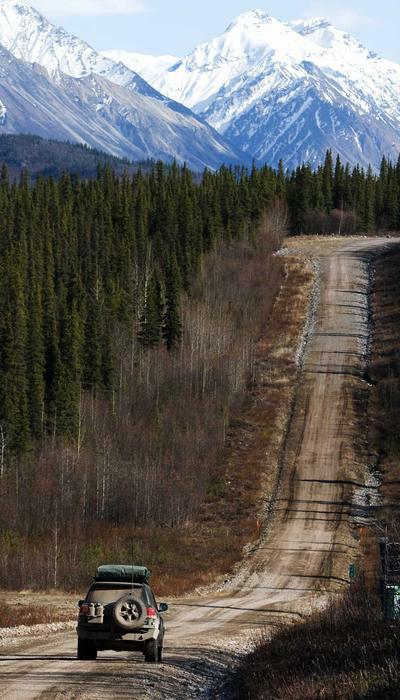 The Dempster Highway in Canada is also of interest with Inuvik at its northern tip. Though not as far north as Prudhoe, it is supposed to be spectacular to drive during the summer. I may also fly to one or two of the towns not accessible by road in Western Alaska. That all said, I will generally let things unfold as they happen. Q. Why do comments need approval? A. As with everything else on the web any possibility of communication with potential customers is used by spam-bots that trawl the net looking for sites to place adverts. For example, I already have comments that if approved would advertise insurance services and online gambling! A. At nights I am guessing temperatures thus far fell to between 15F and 30F depending on altitude. I’ve been told the last week or so has been colder than usual for this time of year. Q. Do you camp every night? A. No and if you read all my posts you will already know this to be the answer! I generally camp where camping provides the best opportunity to experience somewhere. In addition to my roof tent I have my backpacking tent that I will use in Katmai at the McNeil River bear sanctuary. When not camping I’ve stayed in log cabins, inns and motels. Originally I had planned to buy a class C RV designed for off-road and self sufficient travel that is built on a Ford F550 commercial truck chassis. You can see one here. There is no doubt that it would fit right in with Alaska and would probably be ideal for a winter trip here as well. However, it had a number of drawbacks for my immediate requirements. It uses ultra low sulfur diesel (ULSD) which is not yet available in places like Mexico (apart from close to the US border), it is still too large for some of the places I would like to visit and finally, without going into too much detail here, it would put the money on deposit for any ‘carnet de passage’ should I ever require one (in lay terms a car passport that avoids the need to pay customs duties at borders) at more than I would want to consider. Q. How far have you traveled so far? A. Good question. I need to do some sums and perhaps update some posts with distances but so far about 5000 miles. Q. Is that your car in the picture at the top of the page? Other than the tent what are the other items? A. Yes, it is. That picture was taken near Jackson, Wyoming. The other items are a fuel can and a power tank containing compressed CO2 for the tires. There is also a compressor under the hood if required. I was somewhat out of contact in Denali National Park since last Monday and arrived back in Anchorage to a number of questions. I will endeavor to answer them shortly. I have to make a brief trip back to Denver for a few days before the next leg of my journey that will also give me a chance to bring everything here up to date! As I am editing this ‘live’ please bear with me as I make updates. I will generally stick to the chronology of my trip as WordPress allows users to set the date and time of an entry. For any smarty pants who say the date should only be the day of the post itself I will happily mail you a bucket of sand to pound. That being said, you may need to scroll back and forth a bit unless you choose to wait a few days. Although today was my last day in Denali National Park it also turned out to be the best. Awaking to cloudless skies it started out cold but warmed up quickly and Denali was clearly visible. After packing up my camp, I drove along the road to the ridge just before the checkpoint overlooking the area where I had seen the Grizzly sow and her two cubs two days ago. I chatted to a local worker, Foster, who had missed a bus out of the park and he commented that generally it was just a question of waiting and we would see the bears if they were still in the area. Sure enough within about 10 minutes someone who had pulled over further down came running up to us to say there were bears making their way along the river. Although they were still too far to capture a half way decent photograph (even with a long telephoto and a tripod) they were clear through my binoculars and I spent the next six hours watching them slowly make their way along the river digging up and chewing the roots that they eat at this time of the season. Times like this make you appreciate the value of patience. Over the course of the six hours the bears didn’t to do much more than dig and chew or lie down in the sun. Buses would come past, stop for a few minutes so passengers could watch and move on as would most other motorists, hikers and the like. What many missed I was able to see due to my fortuitous lack of schedule, brief moments of the two cubs standing and wrestling each other, rolling around, playing in a completely uninhibited manner and generally behaving as only you might otherwise see on a television documentary. You see this and you understand why some people watch animals for days at a time. For those lucky enough to view this spectacle from a bus, congratulations – I’ll take you with me to the casino – my guess is you can count that number as a fraction of those who visit the park. Denali is a great place to “check off” a bear sighting but if you have the time you have the chance to see so much more if you are patient. So, if you come here on the bus looking for wildlife and you spot bears its worth considering canceling the rest of your day, getting off the bus and just watching for as long as you can. Take advantage of the fact that the bus is a shuttle bus and you can get off and on as you please as long as there is a seat. Today I hiked directly from the campground through brush toward the Savage River navigating my way across various natural drainage tributaries that I expect flow into the Savage, most of which were relatively dry. Within a short time of walking I saw caribou munching their way through the trees just to the south of me and as the landscape opened up a little more, the terrain began to drop off into the valley where, as expected, I found the Savage river. Once at the river I began following it north toward the checkpoint on the park road. As the road came into view on a ridge above me I noticed a bus and a few cars parked presumably watching something. Shortly thereafter, one of the people started waving at me and called out that there were bears ahead further along the river! I changed my course accordingly and ascended the slope toward the road to get a view of the area ahead. Sure enough, a mother and two cubs were foraging further down the river toward the bridge. After watching for a while I continued in a large arc around them and made my way across the bridge to the checkpoint where I chatted with the ranger there. I told him I had seen the bears so he could let other hikers walking along the river know if they passed. He thanked me and then relayed his own bear stories one of which included a direct encounter where a bear had approached some tourists in the parking lot. He told them to stand behind him so the bear charged him instead! After swatting it on the nose with whatever he had in his hand at the time and kicking gravel in its face, it retreated. We ended up talking for about an hour as he explained how he spent last winter/spring helping to build base camp for Denali climbers out on the glacier and how he had moved to Alaska from New Mexico. While talking to another ranger later at the back country access center who told me the ranger I had spoken with at the Savage checkpoint was her neighbor it became very clear that those who stay in Alaska during the winter form a close community. Some have alternate work during winter as the park requires very few employees outside of the summer season, some do voluntary work in the park if available and others just take the winters easy, if thats possible! This group is distinct from those who come to work in the area for the summer and return home afterwards whether it be to Anchorage, other parts of Alaska or the lower 48. Those who stay endure what to you and I would be tough living conditions, very little day light and extremely cold temperatures. Evidently last winter it reached as low as -60F. At times like this dog mushers are able to keep busy tending their dogs but many others simply “hang out” in their cabins, keep their log fires going, visit their friends when they can and otherwise spend a lot of time just ‘being’. For a situation that I and most other people probably wouldn’t contemplate it is also interesting to hear some of them tell me they enjoy the winters more than any other time of the year. I am sure that most people visiting Alaska or Canada have bears and other animals on their mind, whether it be to see them or avoid them. I’m no exception in that respect. I’ve already seen a number of black bears but it is more likely I will see Denali grizzlies over the next few days. These bears typically weigh around 500lbs and are bigger than black bears but smaller than their brown cousins on the coast who benefit from a rich diet of salmon. The Denali grizzlies predominantly eat vegetation as there are few fish in the glacial streams and rivers due to the silt. In two weeks time I have a wilderness camp booked at the McNeil River Sanctuary where I perhaps have the best chance of seeing bears up close. 1. Bear encounter. Do not run. Stand your ground, slowly wave your arms above your head and talk in a firm calm voice to the bear. “Hello bear. Just visiting. Not here to bother you.” If the bear doesn’t move, slowly move back and continue until he starts ignoring you. If on the other hand he charges you which is more likely if you startled him, stop and stand your ground. Again, do not run. Most charges are supposedly bluffs! In theory he will via away at the last moment. (Interestingly I have seen this behavior when a dog charges another dog.) If he doesn’t via away I heard variable advice. If it is a black bear fight back. If it is a grizzly or brown bear play dead for a couple of minutes before fighting back. Usually, if they consider the threat you posed over they will lose interest. In all cases never run because it only triggers the predatory instinct and causes a chase. 2. Moose charge. Run for the nearest trees! Moose have no predatory interest and although they can outrun you they can’t move as quickly as you through trees. Once you are out of sight and they believe you have no interest in harming them they will stop chasing you. Can you spot the bear? This was through a hand held zoom from the bus – he was quite a long way away! Today was my first trip into the park beyond the checkpoint and is probably quite typical of a day for most visitors who use the buses. My shuttle bus was due to leave the visitors center at 7.00AM and pick me up at Savage River campground around 7.30AM. I rose about 6.30AM to snow so after a quick breakfast made my way to the bus stop. The bus arrived on time and once aboard we made our way slowly west towards Toklat which is as far as it goes at this time of year. Toklat is about a 6-7 hour round trip if you don’t get off to hike and service to Kantishna which will open for the season in a couple of weeks is a 13 hour round trip. Due to the snow conditions we didn’t see a whole lot for more than half way to Toklat but conditions thereafter began to improve. The bus must navigate a number of passes along the way and in many places there is barely room for buses to pass each other with sheer drop-offs on one side to be avoided! The bus was full and although it stopped for any signs of wildlife, to really experience the park you need to get off and go ‘walk about’. Shuttle buses will pick you up on the way back anywhere along the road. There are virtually no defined trails in Denali – the rangers ask you to make your own way to minimize the signs of human traffic. Interestingly, although the drivers of the shuttle buses are not obligated to talk or provide information about the park (unlike the tour bus guides), they clearly enjoy sharing their experiences and are on constant look out for wildlife. As a result, although you are only buying a shuttle ticket many people use the shuttles as an informal alternative to a tour. As we approached Toklat, we heard what everyone had been waiting for the whole way as the driver called out “Grizzly at 11 O’Clock!”. 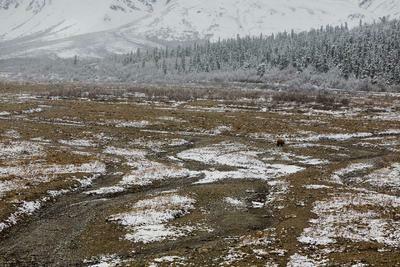 Sure enough, there he was, my first grizzly bear sighting, ambling along the river to the south of the bridge at Toklat! After stopping for a few minutes to watch we proceeded to the parking lot at Toklat where there is a small ranger station. From here, I decided to hike north along the Toklat river (opposite direction to the bear!) for a while and catch a later bus. A few other people also left the bus here but most didn’t seem intent on walking far from the parking lot though I did see one group, under the watchful eye of a park ranger, making their way towards the bridge where we had viewed the bear . The rule is that it is acceptable to be close to a bear if it is not intentional or it approaches you but you must not intentionally approach a bear within a quarter of a mile. Walking toward the bridge would be close to violating this rule hence the ranger’s interest. The weather was much clearer now but still not wonderful. As the road disappeared from view behind me it was a strange feeling to be somewhere where there is no trail. OK, I was following a river, I had a compass, GPS navigator, map etc… but almost anywhere else in the back country in the US you are invariably on a trail of some kind and are expected to stay on it. Denali is one of the few places that gives you a real sense of freedom in this respect. I saw plenty of bear prints along the river in the sand, perhaps from the bear we had seen earlier, I don’t know. The fact that there were none in the snow suggests the owner of the prints had not been there since yesterday before the snow started. The river flowed in an open landscape amidst glacial debris and the scenery didn’t change much as I walked. Imagine a long pebbly beach with a river, rock pools, bluffs either side, mountains in the distance and you have the picture. After a couple of hours hiking I returned to catch a shuttle back to camp. Leaving my cabin at Byers Lake around 7.30AM the sky was clear and Denali was clearly visible with small clouds floating by its summit. I stopped at a couple of points along the highway to view the mountain and take a couple of the pictures you will see from everyone else that visits the area. Interestingly, only about 20% of visitors get to see the summit because it is shrouded in cloud most of the summer. On arrival at Denali National Park, I drove to the Wilderness Access Center where you reserve bus tickets for the shuttle that takes you into the park. Private vehicles can only travel as far as the Savage River about 14 or so miles into the park. Past that point only shuttle buses and tour buses are allowed with the exception of those with special permits or those staying at the Teklanika campground for 3 or more nights. I originally wanted to stay there but it is temporarily closed due to being engulfed by more than 3 feet of ice! The park road runs a distance of about 95miles to Kantishna but at this time of year is only open as far as Toklat for buses, about 53 miles. One piece of advice that I already learned is that if you wish to visit the park during July make sure you book the bus tickets well in advance! I was lucky because this time of year things are still only beginning to open. I could spend all day writing about the logistics of maximizing the enjoyment of a visit to the park because it is not the most straight forward of places I have ever visited. For example, although I booked my camp spot at Savage River Campground (mile 13) in advance I had to check in at Riley Creek Campground near the park entrance. I realize I probably missed something I should have read somewhere but I didn’t find out until I arrived at Savage and read the pertinent information on the entrance sign to the campground! That meant an hour or so round trip drive back to the entrance to check-in. If you want to visit the park I suggest you either phone the reservations service or throughly read everything on the park’s website! Of course if you come to the park on a tour it will all be pre-arranged. Once at my camp spot I got set up for 4 nights and then made salmon marinated in lemon juice with vegetables for dinner. No tinned food at my camp! It’s good knowing that I don’t have to pack everything away in the morning for a few days. The other major positive is that I’m not one of only two people in the campground for a change! Many of the sites are occupied and I actually have neighbors. This evening I shared my fire and good conversation with one set of neighbors, Lynsey and John who were here from the East Coast. They would return the favor two nights later. Thanks for leaving your leftover firewood for my last night! Perhaps we can thank these relatives of the Big Horn sheep found in Colorado and elsewhere for the establishment of Denali National Park? 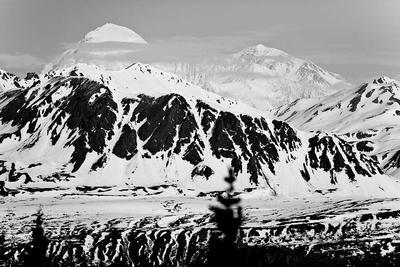 Many people visiting Alaska face the decision as to what to call its famous mountain. The choices are Denali meaning “the high one” in Athabascan or McKinley as it has been officially designated on maps since it was renamed after William McKinley, a one-time presidential nominee, by William Dickey who was a gold prospector. Some continue to call the mountain McKinley simply to differentiate it from the park which has been renamed to Denali National Park. Much information on the background and history to this can be found via a quick search but suffice to say I will refer to the mountain as Denali. It is worth noting that the national park is not there simply because of the mountain even though it is named after that which looms above it. 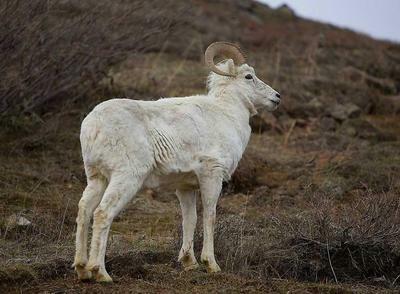 We can possibly thank the Dall Sheep for its creation in the early 20th century. Again, there is plenty of information available on the web. I am consciously trying to limit the extent of any descriptive writing to what seems pertinent to my experience. Otherwise, to quote a friend “you need to take care that keeping your blog up to date doesn’t become a full-time job”! Hence the disclaimer when I sent the original link to it. For general information about anywhere I visit or pass through there is plenty already on the web. In some entries I have included links, in others a quick Google search will reveal all any reader should desire to know about a particular place or topic. A relatively lazy day. After a late brunch and searching out various stores for provisions, I slowly made my way north toward Denali National Park taking the Old Glenn Highway in a couple of places and rejoining the George Parks Highway further on. I reached the turnoff for Talkeetna and decided to check out the campground there. 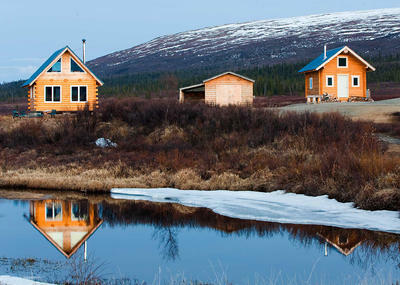 Talkeetna is where many of those wishing to attempt a summit of Denali begin their trip. They can fly from here directly to base camp at 7200ft. You can also take a tourist flight to view the mountain and even land on a glacier. Talkeetna itself is a rustic village but unfortunately the campground looked more like a local garbage site today. There was litter everywhere. Apart from the National Parks it is amazing just how much litter there is in both established campgrounds and National Forest areas. You might be in the middle of nowhere but evidence of humans is still abundant. In fact, while I’m on the subject, driving along the Alaska Highway I don’t think I ever traveled more than a few hundred yards without seeing a plastic bag floating about. I decided to stop for dinner here and find somewhere else to stay afterward. Cafe Michele in Talkeetna is a must visit – a culinary oasis might be an overstatement but the food was truly excellent. Having had the opportunity to see their website since I now see that it is very well known! (Also impressive that they secured the domain name ‘cafemichele’ here in Alaska!) It is certainly worth making the detour to Talkeetna if you visit Denali just for Cafe Michele. After dinner I traveled back to the George Parks Highway and continued north. By around 10.00PM I hadn’t spotted anywhere to camp so pulled over at a log cabin inn at Byers Lake where they had one cabin left. I suppose that is the good thing about this time of year – the season is still early and if you see somewhere to stop there is a good chance they have room for you. Anchorage is the largest city in Alaska, about 250,000 people. Compared to everywhere I’ve visited since Calgary it is of course large but on a global scale it is still a small town, smaller than Aurora, Colorado. It rained most of Saturday so I used the time to walk around the town, run errands and get to know where everything was including the local REI outlet. No early start today. The weather was overcast and chilly and it was only when it started to look like rain that I made the effort to pack up. After steak (grass fed!) and eggs for breakfast I made my way on the Denali Highway. In some small way parts of it reminded me of driving through the Peak District or Lake District in England during winter only on a much larger scale and on an unpaved road! Of course, the overcast day prevented many of the more spectacular views from being visible today. Before the George Parks Highway was built that connects Anchorage to Fairbanks and passes Denali National Park this was the only road to the park. It is now a less traveled road, gravel much of the way and links Paxson (pop. 20) to Cantwell (pop. 218). During the winter season the 134 mile road is unmaintained but left “open” which means you travel at your own risk and I assume increases the probability of having to turn back or even become stranded by either rocks on the road or bad weather or both. The road actually continues West from Cantwell for a number of miles but I didn’t take that today. Before this road existed,you would have taken the train or plane to Denali and before that you probably needed sled dogs in winter and a good pair of walking boots in summer, not to mention a few weeks to get there! I forgot to mention in my last post that due to it being Memorial Day weekend, I couldn’t reserve the campground I selected in Denali National Park. In any case, the park would be more crowded over the holiday (if it is possible to be crowded in Alaska) so I elected instead to book it for 4 days from Memorial Day (Mon 26th) and check out Anchorage in the meantime. A 250 mile each way detour wouldn’t amount to very much in the grand scheme of things and it would also give me a chance to clean up a bit after two weeks on the road! 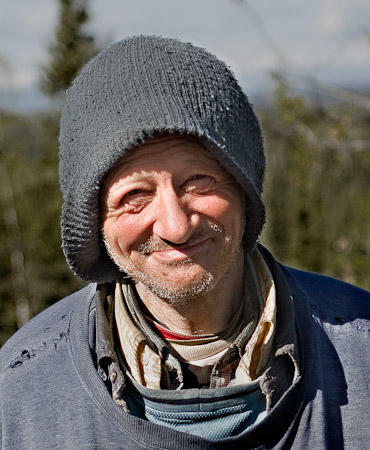 Today I met a homeless chap who was cycling the 400 or so miles from Anchorage to the Canadian border and claimed to be the son of World War 1 pilot Alfred Atkey… He told me he makes this trip on a regular basis and although he is Canadian he never crosses because he doesn’t carry ID. Anyway he had stopped to make some coffee but ran out of water so having supplied him with some and chatting about the exploits of his famous father I took this snap. I’ll let you decide if you agree his story to be true – click for a picture of Alfred Atkey. Leaving Skagway behind at 7.00AM I watched the humpback whales spouting in the harbour from the deck. Unfortunately they barely emerged from the water hence no picture. There were now 4 newly arrived cruise ships docked at Skagway. A number of my fellow passengers were on their way to various adventures in different parts of Alaska their activities hinted at by the various equipment carried by their vehicles. What a contrast Haines was to Skagway. The town that turned down the cruise ships may have paid the price in terms of the ‘spick and span’ effect but perhaps it has been left with more substance. Its real. On reflection, Haines is to Skagway as Crested Butte is to Aspen. North to the eagle preserve where more than 3000 bald eagles gather during the October to Dec late salmon run. That must be a tremendous spectacle. Today I was told there are a couple hundred pairs or so in the preserve. During my time there I spotted half or dozen far away on their lofty perches. Even with a long telephoto lens they were still tiny in the frame. This is a place that would certainly be worth visiting for a few days during autumn. Onward and a long drive through more spectacular Yukon country stopping the night at Beaver Creek just before the Alaskan border. This Beaver Creek is very different from the one in Colorado! 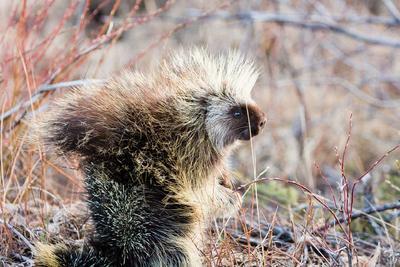 As with many of the roadside service towns it is only just awaking from its winter slumber – the restaurant there was opening for the first day of the season and staff had arrived from various parts of Canada for their summer stint. The lodge/restaurant/campground staff here have their own “hotel” because they are only here for the summer months. I quoted hotel because from what they told me about the standard of their accommodation hotel is probably not an apt description!